Nara Park, Nara, Japan. Photo: Kosuke Arakawa (www.kosukearakawa.com). Image©www.thingstodot.com. Nara can easily be done as a day trip from Osaka or Kyoto. It takes about an hour by train from both the JR Osaka Station and Kyoto Station to reach Nara. It is famous for the Nara Park where deer roam freely and the Todai-ji Temple that has the world's largest gilded bronze Buddha. I don't recommend staying overnight in Nara. A day trip is sufficient to see the most important sights in the city. My suggestion is to go there early to beat the tourist rush. Being an important tourist destination, it can get very crowded! The Nara Park is a five minute walk from the Kintetsu Nara Station and a 20 minute walk from the JR Nara Station. Hundreds of deer roam freely in the park. They have become a symbol of the city and are considered as a natural treasure of Japan. 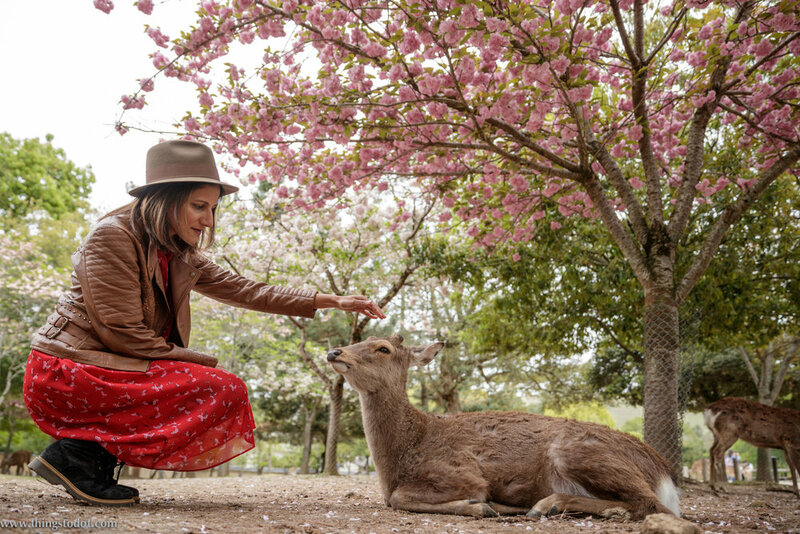 The deer are usually very docile and enjoy being patted by the tourists. However, they can get aggressive when visitors feed them. Deer crackers can be bought at the park. Some of the deer have also learnt to bow to people when they want crackers! 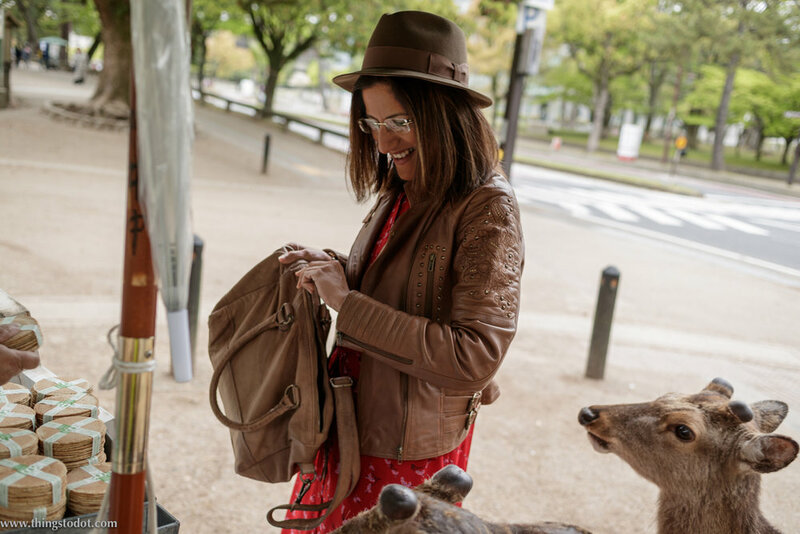 Nara Park, buying deer crackers, Nara, Japan. Photo: Kosuke Arakawa (www.kosukearakawa.com). Image©www.thingstodot.com. Tōdai-ji is a Buddhist temple complex and a landmark of Nara. It is one of Japan's most important and historically significant temples. It constituted the powerful Seven Great Temples of Nara. It is also a UNESCO World Heritage Site. Its Great Buddha Hall houses the world's largest bronze statue of the Buddha, known in Japanese as Daibutsu. The statue stands at a height of 15 meters and is flanked by two Bodhisattvas. Deer roam freely in the temple complex and are considered as messengers of God. Todai-ji, Nara, Japan. Photo: Kosuke Arakawa (www.kosukearakawa.com). Image©www.thingstodot.com. Todai-ji, Buddha Statue, Nara, Japan. Photo: Gunjan Virk. Image©www.thingstodot.com. Kasuga-Taisha is Nara's most important shrine. It is a Shinto shrine dedicated to the deity who protects Nara. Together with Kasugayama Primeval Forest which can be found near the shrine, it forms a part of the UNESCO World Heritage Site. It is famous for its bronze lanterns that lead up to the shrine. Kofuku-ji is another Buddhist temple in Nara that once formed a part of the powerful Seven Great Temples of Nara. It is also a UNESCO World Heritage Site. Kofuku-ji, Nara, Japan. Photo: Kosuke Arakawa (www.kosukearakawa.com). Image©www.thingstodot.com.